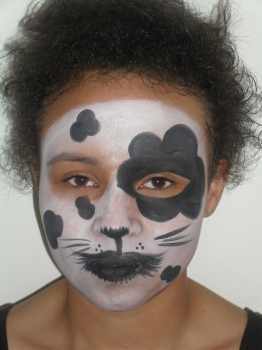 The coolest dog face painting ideas are here for you to look at also get some free face painting ideas. I'm sure I don't have to tell you how much FUN kids have with these kind of toddler activities. The easy step by step face painting pictures with easy face painting instructions below show you how to create this animal face painting design for yourself. 1. 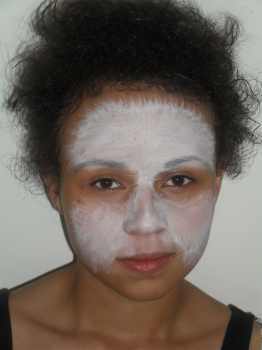 To start begin by covering the face in a white base as in the picture. Now we are going to paint a spotty dalmation dog face. Always take care not to get paint in the eyes. As this picture shows an area around the eyes is left unpainted. This is more important for very small children that may rub their eyes without realising. 2. Next use the black base for around the cheeks and eyes. You need to create the dlamation spots using the black paint. Painting one big spot over one eye then several smaller spots gives the best look. Next paint the lips with black paint. Then paint black under the nose and a line joining the nose to the top lip. Next use a fine brush and the black paint again. This time paint some short thin whiskers around the mouth. Finall to finish create some whisker spots above the top lip. Then some lager whiskers on each cheek, three whiskers on each cheek is usually enough. You can print of a dog face painting template here as a pdf. It saves having to print the whole of this webpage. If your looking for more face painting ideas then this video below shows you how to face paint a puppy dog.